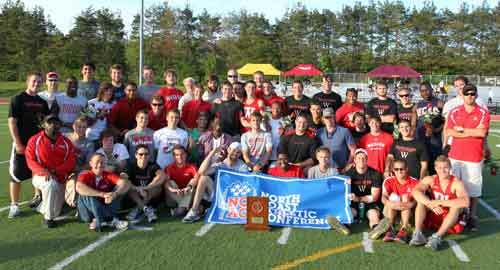 Wabash captured its second consecutive North Coast Athletic Conference Men's Outdoor Track and Field title Saturday afternoon. The Little Giants set another conference meet record, scoring a total of 314.5 points to break the mark of 311.5 points from last season. Freshman Derek De St Jean was named the Men's Field Athlete of the Meet. The first-year performer won conference titles in the shot put and discus and finished third in the hammer throw. The Little Giants tallied eight individual or relay conference titles, produced 32 all-conference honors, and place 55 athletes in the top-eight spots during the two days of competition. Kevin McCarthy started the Saturday portion of the meet by setting a new conference mark in the 3,000-meter steeplechase. His winning time of 8:58.21 crushed the old meet mark of 9:12.36 and is currently ranked third among NCAA Division III times this season. His time was also only 17/100th of a second away from tying the 40-year-old Wabash record in the steeplchase set by Ray White '73. Jacob Caddick added a seventh-place finish in the event with a time of 9:43.14, while Zach Mahone took eighth place with a time of 9:43.85. Evan Groninger set new Wabash and NCAC records with his throw of 62.90 meters (206 feet, 4 inches) to win the javelin competition. He broke the mark of 62.08 meters set by Daniel Ambrosio earlier this season. 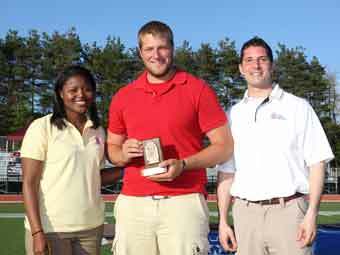 Groninger's throw bettered the conference record of 206 feet set in 2002 by Wittenberg's Tim Gaal. Ambrosio finished third in this year's javelin throw with a mark of 52.52 meters (172 feet, 4 inches). Sam Glowinski added a seventh-place finish with a throw of 41.45 meters (136 feet). Jake Waterman won the 800-meter run with a time of 1:52.71. He has already posted the fastest 800-meter time in the country with a mark of 1:48.64 set two weeks ago at Indiana University. Cole Hruskovich earned all-conference honors with a second-place finish in the 800 (1:54.46), while McCarthy took fifth place (1:55.49) and James Kervan was eighth (1:58.71). McCarthy added a second-place finish in the 1500-meter run with a time of 3:56.15). Donavan White picked up all-conference honors with a third-place finish in the 1500 (3:57.09), with Shane Hoerbert crossing the line in fourth place (3:57.36). Waterman finished seventh in the event (4:01.05). Ronnie Posthauer was crowned the 110-meter hurdles champion, edging teammate Nathan Mueller at the finish line. Posthauer won the finals race with a time of 15.11, while Mueller crossed in 15.19. Billy Rosson took fourth place with a time of 15.25. Freshman Grayden Gilmore took first place in the high jump, clearing 1.94 meters (6 feet, 4.25 inches). Ambrosio tied for third place with a height of 1.88 meters (6 feet, 2 inches). John Boguckitook sixth place (1.85 meters; 6 feet, 0.75 inches), while Patrick Posthauer finished seventh (1.80 meters; 5 feet, 10.75 inches). The foursome of Arion Clanton, Alfred Sambo, Sean Hildebrand, and Vann Hunt combined to win the 400-meter relay with a time of 42.23. Garett Bonk, Hruskovich, Joseph Conti, and Joel Whittington took second place in the 1600-meter relay with a time of 3:20.10. Whittington finished second in the 400-meter hurdles (54.79), while Rosson scored a fourth-place finish (56.34). Hunt, the winner of the men's long jump on Friday, finished second in the triple jump with a mark of 13.51 meters (44 feet, 4 inches). Femi Oluyedun took third place to earn All-NCAC honors with a leap of 13.35 meters (43 feet, 9.75 inches). De St Jean's mark of 46.07 meters (151 feet, 2 inches) gave him third place in the hammer. Joel Beier finished fourth (45.59 meters; 149 feet, 7 inches), while Brad Pusateri finished eighth (39.83 meters; 130 feet, 8 inches). John Haley picked up a third-place finish in the 400-meter dash finals by crossing the finish line in 49.28. Bonk was sixth overall (50.17). Conti grabbed seventh place (50.63), while Chet Riddle finished eighth (51.37). Brian David was third in the 5,000-meter run with a time of 15:20.29. Billy McManus took sixth place (15.29.93), while Jared Burris finished seventh (15:34.26). Hildebrand took fourth place in the 100-meter dash with a time of 11.03. Sambo finished fifth (11.03), crossing 4/1000th of a second behind Hildebrand. Hunt added a seventh-place finish (11.34). Haley finished sixth in the 200-meter dash (22.31). Hildebrand took seventh place (22.52), and Riddle was eighth (23.07). Wabash had already captured the NCAC cross country and indoor track and field titles this year, making the Little Giants the 10th team in 28 years to win all three championships in the same season. In addition to the team and individual honors, Wabash head coach Clyde Morgan and his assistants earned Men's Coach of the Year honors. The Little Giants' almost doubled the total score by second-place squad Ohio Wesleyan (157.50). Oberlin took third place (71), with Allegheny finishing fourth (64). Wittenberg (62), Denison (60), DePauw (49), Kenyon (23), and Wooster (16) completed the team scoring.